On the 9th of March, 1925, there was begun the labor preliminary to the gigantic task of pouring 175,000 cubic yards of concrete to build the St. Francis Dam. A year later, almost to the day, there stood completed, at a cost of $1,250,000, this colossal undertaking, 205 feet high, 1225 feet long on its crest and 150 feet long at its base, and 160 feet thick at the stream level. Standing at a point along the line of the Los Angeles Aqueduct, between Municipal Power Plants No. 1 and No. 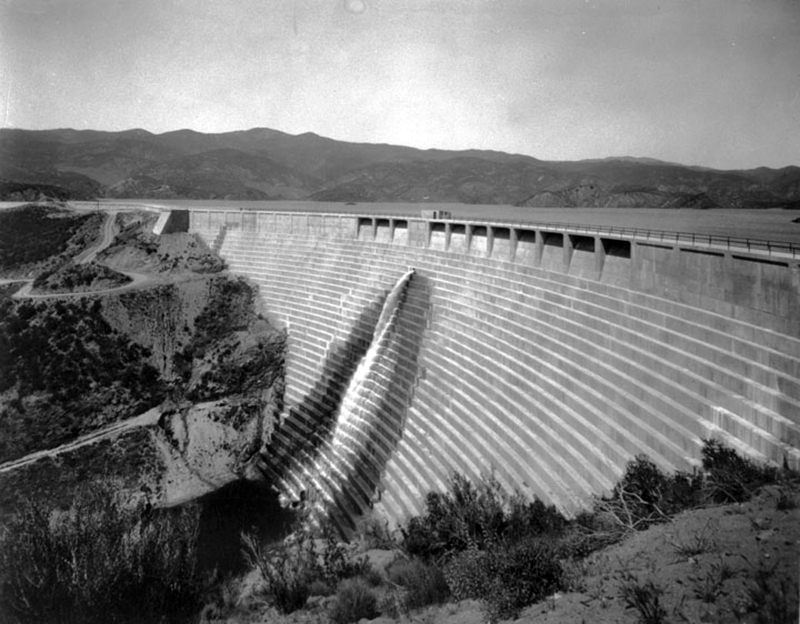 2 in the San Francisquito Canyon, 42 miles north of Los Angeles, Chief Engineer William Mulholland, on the 12th of March, 1926, threw open an inlet gate to admit the water to fill the reservoir created by this structure. Flowing at the tremendous rate of 70,000,000 gallons a day, it will take 170 days to fill to its full capacity of twelve billion gallons this three-mile-long lake, one of the largest in Southern California. To safely impound this vast flood, the dam is of gravity type, arched upstream to provide the maximum factor of safety, as befits the second largest reservoir in the Aqueduct system, exceeded only by the great Haiwee Reservoir, 185 miles north of Los Angeles. The object in creating this newest storage basin is to enlarge the reserve supply of Aqueduct water that it is designed to keep always on hand in near proximity to the City. The six principal basins already thus established store almost 48,000 acre-feet of water. The St. Francis storage basin will impound nearly 40,000 acre-feet additional. In addition to its utilitarian features, the new lake thus created will constitute a scenic gem amid our mountain fastnesses that will, without doubt, prove in time a great attraction both to tourist and resident alike. In 1924, construction began on the St. Francis Dam, which was given an anglicized version of the name of the creek bed on which it rested. The project began quietly so that the farmers dependent on the water of the San Francisquito Creek wouldn't notice the dam and try to stop the construction. The St. Francis Dam was designed to be 175 feet tall and to hold back a reservoir of 30,000 acre feet. Immediately after construction began in 1924, Mulholland decided to raise the dam 10 feet and increase the capacity of the reservoir to 32,000 acre feet. Since little construction had been completed, some minor changes were made in the design to accommodate the change. However, in July 1925, when the dam was about halfway completed, Mulholland again decided to raise the dam another 10 feet to a total height of 195 feet. A "wing dike" had to be constructed on the western side of the dam to keep water from spilling over a low ridge when the reservoir filled. Gravity dams like the St. Francis Dam use their weight to resist the water pressure exerted on them. The St. Francis Dam was increased in height from the designed 175 feet to 195 feet at completion, without any substantial widening of the dam's base. Such changes would not occur with modern engineering practices, but little was said about the changes in 1925. LA2401: 9600 dpi jpeg from smaller jpeg | LADWP Photo Collection at Los Angeles Public Library, Cat. No. 1001827 | Online image only.